Reviews of the Nikon Coolpix AW130 from around the web. Nikon updated its rugged compact camera line with the Coolpix AW130, the fourth instalment in the AW series. Across all four generations, very little inside has changed on the inside, but this new little guy does blow the lid off the waterproof depth limit, capable of going up to 30 metres / 100 feet deep. It's also gained NFC and Wi-Fi connectivity. But is that enough to make up for photographical components that have been in standstill for years? 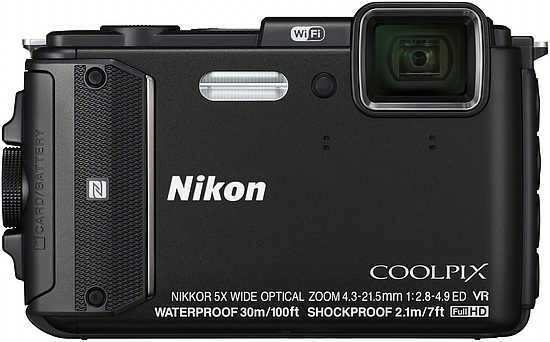 The Nikon Coolpix AW130 is an update to the Nikon Coolpix AW120, and has a new waterproof rating of 30m, improved grip, added NFC, a high resolution 921k-dot OLED screen and fullHD video recording. The AW120 is available in black, blue, orange, camouflage and yellow for around £225.